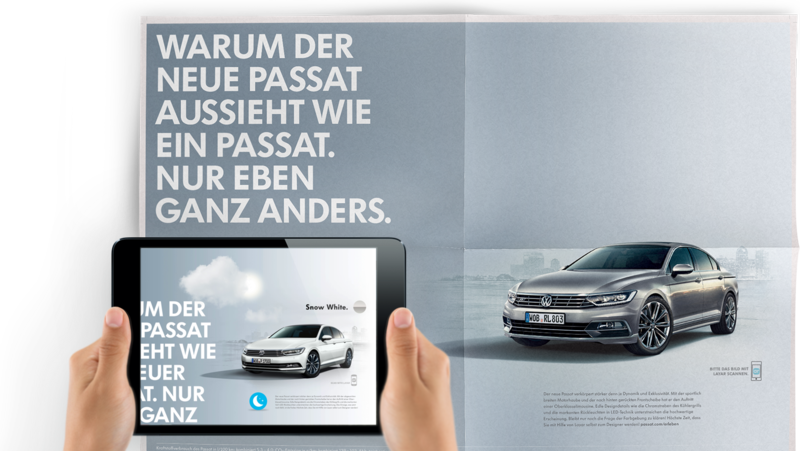 High-profile Augmented Reality Campaign for the launch of the new VW Passat. For the launch of the new VW Passat model -which by the way in my opinion completely shed the old conservative image of a sales rep car- VW asked for an attention grabbing virtual reality campaign besides the classic communication channels such as print and landing page. 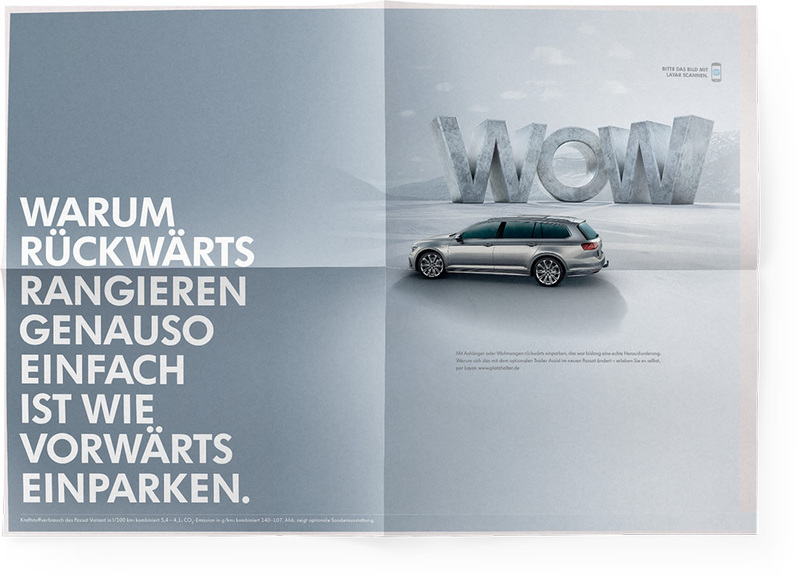 It was to appear as an eight page Ad campaign in the Sunday edition of the popular German newspaper ‘Die Welt’. Due to the time constraint, we decided to go with the popular and widely available Layar App instead of a native App. Layar App is already able to scan images with a mobile camera and convert them into an augmented reality. 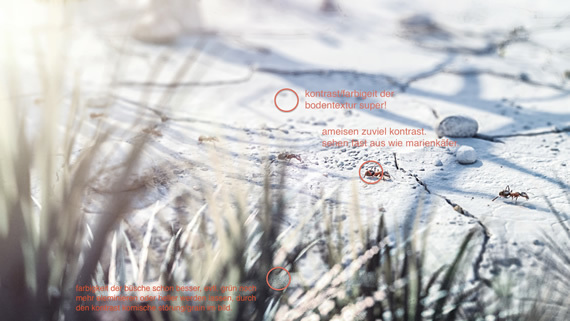 Together with the VW agency Grabartz & Partner, we developed ideas for the principle themes which were then to come alive in virtual reality. The visual look was intentionally kept simple and monochromatic - at a first glace artificial and unreal, like a disrupter/interfering signal. 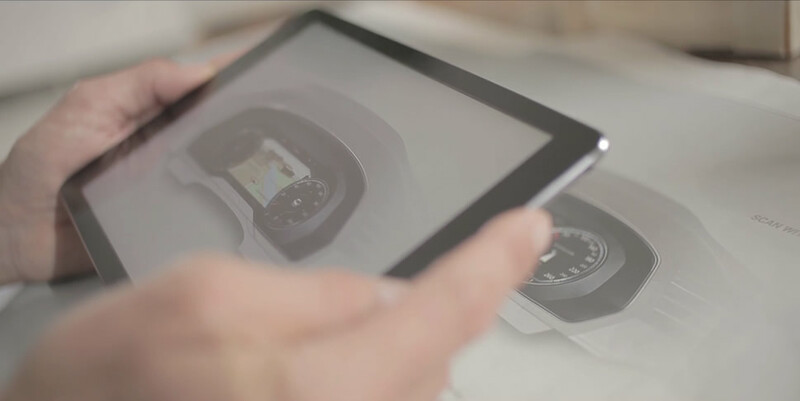 After the scanning of the car image in the ad by Layar App, the smartphone or tablet computer converts it into an augmented virtual reality…. 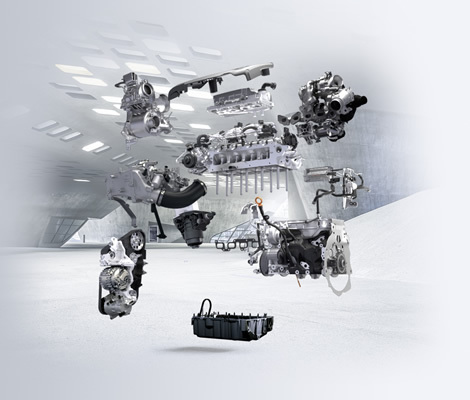 where the reader can then learn more about the innovative features of the VW Passat and interact with them. Bizarre flora and fauna – This is where we set our stage for the models to reveal the actual collection. The project team was sometimes sent for lunch to McDonald’s in order to get the exact measurements of the burger ingredients on the ‘real object’. We relatively quickly developed the intuitive Touch & Drag interface with which the user can create his or her own virtual burger faster but most of all with much more fun. 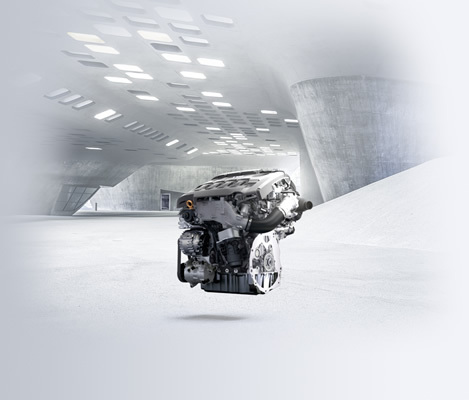 The project started with a joint brainstorming phase about the highlight features of the new Passat. The main objective was to find themes/images which at a first glance were raising questions with the viewer and triggered his or her curiosity. 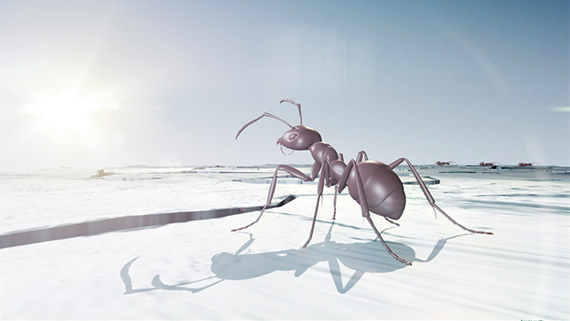 For example the ant theme, which is a methapher for the innovative traffic jam assistant. 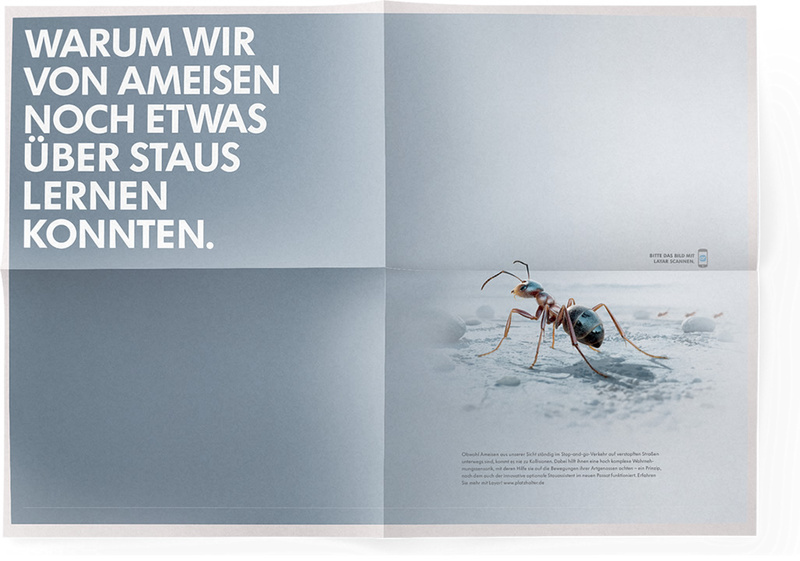 Through the scan of the ad with the layar browser, the ant comes to live and a short film explains the commonalities between an ant trail and the traffic jam assistant built into the Passat. 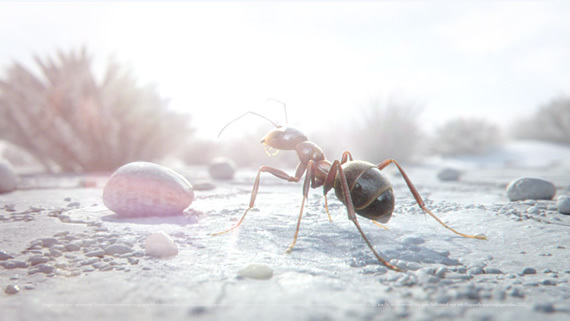 For most of the features and films, which were developed in cooperation with the 3D specialist Mackevision, firstly, look boards were developed for the visual look of the films and settings. In a second step, animatics were created by CGIF from the story boards. They then served after client input as basis for the cut, sound design and voice over. In a final stage, the visual look was further developed and optimized through some further coordination steps among the different teams. 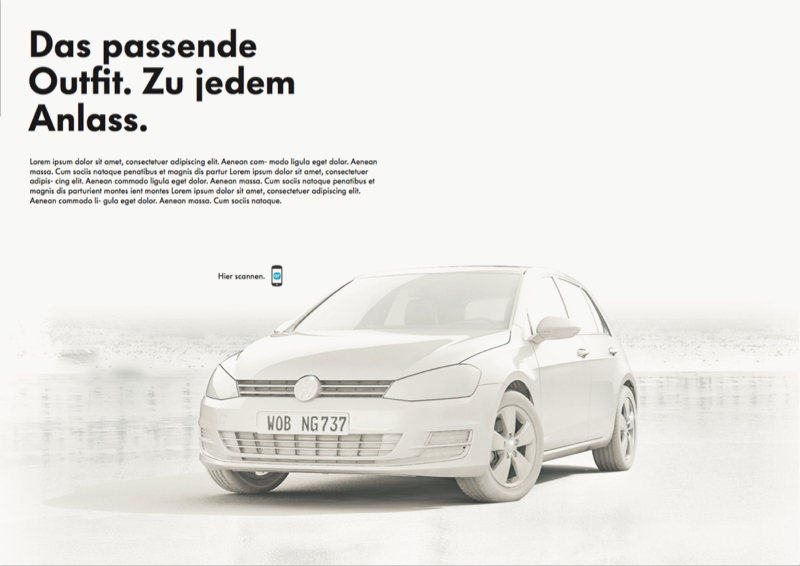 The first version for the campaign visualization did not get the desired approval by the VW executive board. Unfortunately. The idea behind it was to tone down the background visual in the ad to such a degree that the images of the cars and objects appeared like exhibition pieces in a museum – just like porcelain objects in a glass showcase at a manufactory. Out of the ‘white on white look’ as we called, a real image was then to appear through the virtual reality function which would have certainly enhanced the WOW effect.